The Last Queen: A Novel by C.W. Gortner is a novel of great depth, emotion and intrigue. After reading and reviewing Gortner's second novel, The Confessions of Catherine de Medici (which you can read here) I set out to learn more about both the author and his other work. I was fortunate to correspond with the author who graciously allowed me to review The Last Queen: A Novel for you and provided yesterday's wonderful guest post which I'm sure whets your appetite to read more. In this stunning novel, C.W. Gortner brings to life Juana of Castile, the third child of Queen Isabel and King Ferdinand of Spain, who would become the last queen of Spanish blood to inherit her country's throne. Along the way, Gortner takes the reader from the somber majesty of Spain to the glittering and lethal courts of Flanders, France and Tudor England. Born amid her parents' ruthless struggle to unify and strengthen their kingdom, Juana at the age of sixteen, is sent to wed Philip, heir to the Hapsburg Empire. Juana finds unexpected love and passion with her dashing young husband, and at first she is content with her children and her married life. But when tragedy strikes and she becomes heir to the Spanish throne, Juana finds herself plunged into a battle for power against her husband that grows to involve the major monarchs of Europe. Besieged by foes on all sides, Juana vows to secure her crown and save Spain from ruin, even if it costs her everything. This book puts more than a face and a name to one of Europe's most interesting monarchs. 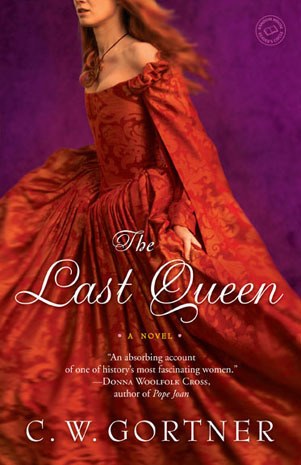 The Last Queen: A Novel takes the reader deep into the political, social and religious intrigue of the European stage in the sixteenth century and sheds light on the strength of women in political roles. C.W. Gortner's portrayal of Juana of Castile is gripping and insightful and you feel the pain of betrayal and the comfort of love that embody the pages of the book. I read this book in one day, on the same day that I received it in the mail - not only because I read quickly, but because I was so absorbed in Queen Juana's world that I just couldn't put the book down. The language, imagery and story draw you in and grip you through the book and left me scouring the notes at the end of the page for more about Juana, her fate and that of her children. Like, The Confessions of Catherine de Medici, The Last Queen fleshes out an otherwise overlooked character in European history and brings her story to light in a sympathetic and believable way. I look forward to many more novels by C.W. Gortner and hope that I have the opportunity to review all of his books in the future. Disclaimer: I was provided with a copy of this book by the author for review purposes. I received no other compensation and all opinions expressed in this review are my own.